In our third installment of our series, Sin, Mental Illness and the Church, we look at a significant unintended consequence of the Biblical Counseling movement, and introduce you to several church leaders seeking to influence the way in which the church understands the struggles of those with identified mental health conditions. Ten or so years ago while attending a scientific meeting, I was hanging out at a reception with a colleague I’d worked with on some medical education projects who was deeply involved with increasingly controversial research involving pediatric bipolar disorder. The research being done at their institution was receiving increasing degrees of scrutiny by some in the media as the prevalence of kids being treated for bipolar disorder exploded. By the time I was considered a “thought leader” in select therapeutic areas within my specialty, I came to understand that along with the privilege came great responsibility. I had (and have) great respect for this investigator and the integrity of the research done at the institution where they serve. But it appeared to many that clinicians in the trenches were misinterpreting the research and exposing kids to unnecessary and potentially dangerous treatments because they weren’t taking into account all of the guidance derived from the research, and my colleague and I politely disagreed about whether he and his associates had a responsibility to intervene. ▪ 30% of attendees seeking help from their church for themselves or a family member because of a mental health condition reported negative interactions counterproductive to treatment. ▪ Women are significantly more likely than men to report being told by their church that they don’t have a mental health disorder (37%), discouragement from their church about the use of medication for mental disorders (23%), and report negative interactions with their church (41%). ▪ Reports of negative interactions from church attendees fall into three categories: abandonment or lack of involvement by the church (60%), mental disorder considered the result of demonic activity (21%), and mental disorder considered the result of a lack of faith / personal sin (19%). ▪ 15% of adults who sought help from their church for a mental illness for themselves or a family member reported a weakening of faith as a result of their interaction, and for 13%, their interaction resulted in the end of their involvement with their faith. 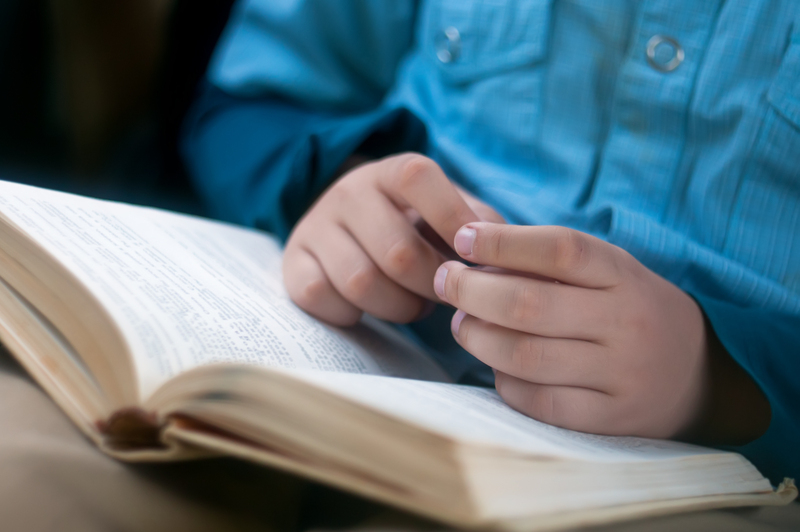 Lifeway Research was involved with Focus on the Family in a large research project entitled the Study of Acute Mental Illness and Christian Faith, the results of which were made public last Fall. Some findings in the Lifeway study appeared to confirm results described in the Baylor study. 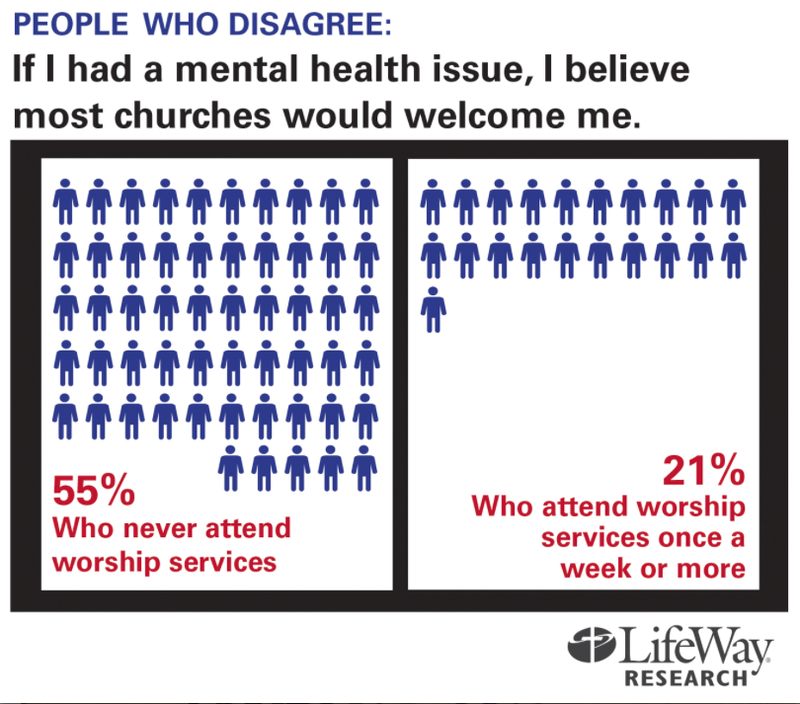 Among individuals with mental illness who have attended church regularly as an adult, 10% changed churches as a result of a previous church’s response to their mental illness, 8% stopped attending church and 5% reported not being able to find a church. In addition, 23% of pastors indicate they have personally struggled with mental illness of some kind, but only 12% of pastors surveyed were ever formally diagnosed. Pastors in the Midwest were significantly more likely to report undiagnosed mental illness. The research appears to suggest that we have a lot of people within the church who struggle with emotional distress who have been badly hurt by their interactions with pastors, church staff, counselors and the reactions of fellow believers. 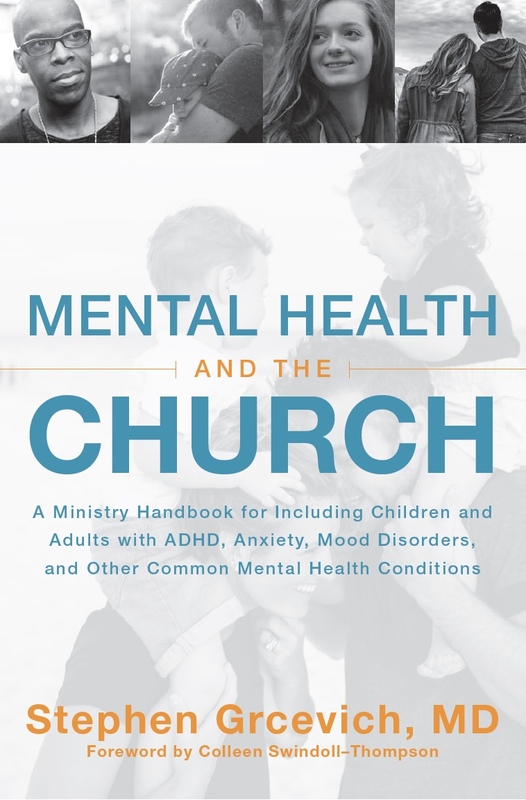 Clearly, there’s an established perception among the majority outside the church that those struggling with more serious or chronic mental health concerns won’t be welcome at church…and that’s a very big problem when it comes to fulfilling Christ’s command to make disciples. Twenty years ago, I was repeatedly told by many people that I just needed to pray harder and that if my relationship with Jesus was better, my severe depression would be healed. I bought into that for a while and did everything humanly possible to pray, study the Bible go to church and so on. But my depression was not healed. I left the church for several years, but returned hoping that not all Christians thought that way. Of course, I also didn’t tell too many church friends about my mental illness. I guess I got off topic of your blog post, but the idea of mental illness or any illness being caused by sin is still very prevalent in out churches, as is the idea that we should be able to pray it away. There are other prominent voices within the evangelical/reformed movements with harsh things to say about our conceptualization of mental illness. John MacArthur did an entire blog series this past September on the topic. Here are links to the first and second part of a two part post that echoes the themes espoused by the Nouthetic Counseling Institute. It appears that a not insignificant number of people who seek help from their churches for mental health-related concerns have experiences so negative that their spiritual life is impacted and some ultimately leave the church. Clearly not the intended consequence of a movement grounded in the idea that the Bible is sufficient in providing answers to the struggles experienced by those wrestling with mental illness. There are ways in which the church can reach out to and include families impacted by mental illness without compromising the truth contained in God’s Word. There are groups within the church wrestling with these issues. Here’s a link to a very thoughtful discussion of the issues involved from the Biblical Counseling Coalition. Ed Welch has a very helpful article in the current issue of CCEF Now (pages 9-11 in the .pdf) on ways that persons in the church can help others with psychiatric disorders. 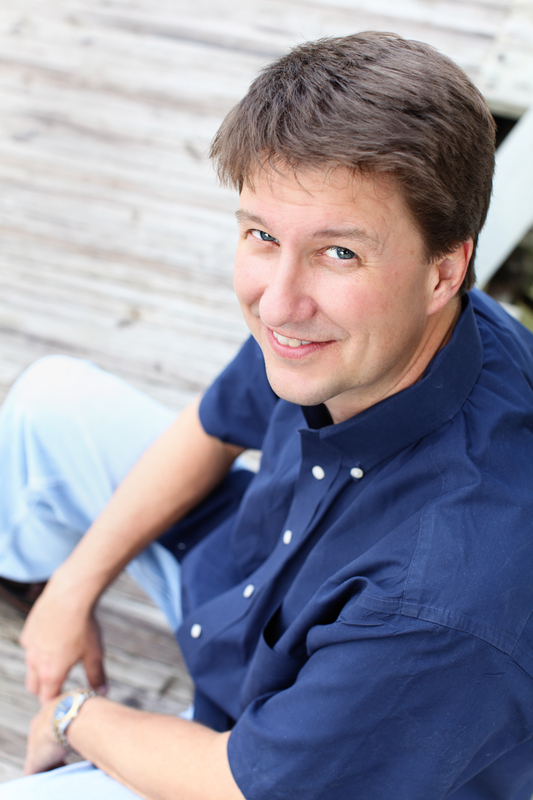 Brad Hambrick has proposed A Christian Perspective on Mental Illness. Next, we’ll look at how kids with identified mental health conditions have been stigmatized in the church. 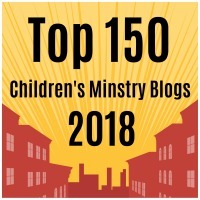 This entry was posted in Advocacy, Controversies, Families, Hidden Disabilities, Inclusion, Key Ministry, Mental Health and tagged Biblical Counseling, Biblical Counseling Coalition, Brad Hambrick, church, Disability Ministry, Dr. Matthew Stanford, Ed Welch, Inclusion, Jay Adams, Key Ministry, mental illness, Nouthetic Counseling, sin, unintended consequences. Bookmark the permalink. Mental illness has biological causes, as well as environmental causes. Until faith communities are willing to recognize this and encourage people to get the help they need, they will continue to fail those with mental illness. There are many great psychiatrists and therapists out there who are Christian or at least respect our faith. We should be encouraged to utilize these resources because they really do aid healing. I speak from personal experience. I will never again talk about my mental illness with my pastor or church family. At a time when I was symptomatic, the pastor gave me some harsh, but necessary feedback. However the way in which she delivered the feedback was not good. When I tried to address that with her, she refused to hear me out. After a lengthy hospitalization, I excitedly returned to church and gave my testimony about why I had been away so long, shared about my depression and my ongoing journey. However, since that time I have become more and more anxious about being there and have been putting up a wall. My pastor had told me that I was emotionally abusive to her and that some had come to her about leaving the church because of me. She did not give me specifics, so I feel very paranoid and anxious that I will say or do the wrong thing. So I attend church and Bible Study and minimally interact with folks. She has said several times that emotional and mental problems are from demons. I feel that if I “prayed right” then the mental illness would be gone. Confused. Need and want to take a break from attending church, there or anywhere. Bad move to let them know about my journey. Extremely bad move to allow myself to be vulnerable with her. Therapy is going extremely well and I have made incredible progress. In most other areas of my life, I am doing super well. And I’m thankful for that. Sometimes we just have to move on. Thanks for sharing your story, but I’m sorry you’ve had to endure a negative experience of church. Everyone in the church misses out on your presence, your gifts and talents when you’re unable to attend. I’ll pray that God uses this experience to get you connected to a church where you’ll be able to grow in your faith and use your gifts to serve others in the presence of your brothers and sisters in Christ.